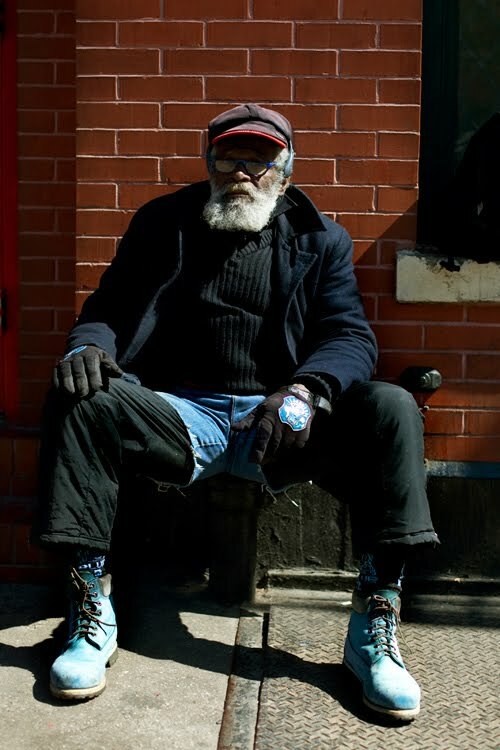 We couldn’t not comment on the most recent entry in “homeless chic” by Scott Schumann, the Sartorialist, who shot and published this photograph of what Black Book calls a “surprisingly stylish homeless man” as Schumann ambled past him in the Bowery. Articulated in this comment, and those that follow the photograph, is a notion of human dignity based on the subject’s apparent capacity for expressive selfhood. In this case, this sense of self is recognizable to the Sartorialist because of the ascribed care in matching boots to gloves to glasses. Thus do the more privileged grant humanity to those persons who are usually excluded by virtue of racial, sexual, class and other hierarchies. But what does it mean to ascribe an admirable resilience, a determination to “not give up,” through another’s sartorial choices? I won’t address the man pictured in the photograph because to do so would be pointless. I have no information about him beyond what’s been filtered to me through the Sartorialist, who did not ask the man his permission to either snap the photograph or to publish it. So I’m not going to pretend I can tell a better or truer story about him than the Sartorialist, or to presume that I can divine his intention or his sense of self from an image of him. I am not going to speculate on how, let alone why, he wore so much blue the day this photograph was made because I can’t actually know. Instead, I want to figure out why other viewers might imagine that they can know. I want to argue that the scene of this photograph’s creation and circulation is the scene of certain conventions for parceling personhood, by way of qualities of timeliness and self-expression as expressed through fashionable discourses. That is, the Sartorialist and friends recognize humanity where they find style; and as we shall see, the reverse seems true for them too. Predicating human worth or social value upon the so-called evidence of self-expression or other sartorial qualities is not new either. I say “so-called,” of course, because some evidence is not recognized as such. If his clothes did not match, would the Sartorialist (or his commentators) assume that he had given up — and what would he had given up that would be visible upon his body, his face, as lost? It is as such that the Sartorialist’s comments betray a belief in the the non-coincidence of, say, mismatched garments with dignity (the quality of “not giving up” one’s humanity). That the homeless man pictured here is judged “timely” bizarrely isolates him from a longer history in which he is devalued because he somehow failed to follow capitalist time. As Judith Halberstam argues, a “good life” is organized according to a series of seminal moments that follow the logic of capitalist accumulation – college or job, marriage, mortgage, children, retirement, inheritance. Such a “good life” often acts also as the exclusionary, even violent measure of one’s value as a “good person,” according to which then a homeless individual would usually be found wanting, even undeserving. His layering is willfully understood as the “surprising” evidence that even the homeless might actually share “our” moment, at least on occasion, thus integrating him back into capitalist time through fashionable coincidence. If layering were currently not a trend, he would continue to be temporalized otherwise — as stuck, or lagging behind. It is as such that in the photograph refuses specific historical meaning in favor of an ahistorical feeling of timeliness, measured out by vague sartorial trends rather than contextual social knowledge. Which brings us to the question of how, and why, matched garments and trendy layers might serve as some baseline standard for the privileged to recognize, rescue, and include the “less fortunate” in their parceling out of admirable, deserving humanity. Here again we might look to the Sartorialist and his words for some indication: “I don’t find it romantic or appealing like a lot of street photographers, and if you asked homeless people they are probably not to [sic] happy about their situation either.” Street photography, and indeed much documentary photography, has a specific humanist tradition; in picturing the indigent, the poor, the oppressed, the conventional hope of such photography has been to illustrate and capture a “spark” of humanity for an audience who presumably does not resemble the indigent, the poor, or the oppressed, and must be convinced of their worth. But the Sartorialist, for all his efforts to distance himself from this tradition, partakes of it himself. Dignity is a thorny and ambiguous concept, but for our purposes we need only gesture toward the labyrinthine paths through which dignity comes to signal an intrinsic, rather than instrumental, value of being human. But it is instrumental; as Ranjana Khanna notes, “the history of dignity in modernity is entirely different for the countries that were former colonial powers than for the colonized.” So while street photography might search for humanity’s evidence in a dignified countenance, the Sartorialist finds it in sartorial self-expression. This homeless man is recognizable as human –that is to say, “one of us”– because he appears to follow (at least in this moment) the same sartorial rules. Thus the Sartorialist, as an authority of “good style,” grants a very conditional recognition through which the homeless man achieves legible personhood to a wider audience. But this recognition of his personhood is only its semblance. The homeless man, thingified as mere image (“I often look at homeless folks for inspiration on what to wear. There is a certain softness to the clothes after being worn day-in, day-out”), instead becomes the scene of other’s projections, other’s speech. Thus, one commenter seizes the opportunity to wax romantic: “It’s so easy to believe that homeless people are down on their luck, but really they have a freedom the rest of us in society do not. The chaos of uncertainty can yield a freedom that eludes the rest of us with our perfectly clean lives…” While another suggests to the Sartorialist, “He was waiting for you,” as if the homeless man had no meaningful existence prior to his aestheticization in the camera’s eye. That is, this photograph and the discourse around it must begin with the unspoken premise that the homeless always already embodies inhumanity, and that only by the discerning intervention of the privileged is the deserving individual rescued, if only for a brief moment, from this oblivion. Put another way, his rehabilitation by others follows after his degradation by the same. Thus the conditional distribution (contingent upon the homeless man’s clothing being read by an “expert” as fashionable self-expression) of a limited recognition (because there is no discussion of either economic restructuring or capital flight, let alone an examination of the violences of the “good life” and its markers) makes no demands from the privileged. It is as such that my lovely co-blogger Minh-Ha argues that this photograph is precisely the problem with fashion studies that read clothes and style as expressions of identity. While we do express ourselves through our commodities and certainly through our clothes, too often sartorial interpretations of identification bleed into moral and social evaluations of personhood, and there lies long, bloody histories and much danger.